Founded by the charming Jeff Sinanaj, along with his brothers-owners of the storied Ben and Jack’s Steakhouse – Empire Steakhouse brings the time honored tradition of quality steaks to Midtown West. With a combined experience of over 25 years as former Peter Luger Waiters, the Sinanaj Brothers are experts at providing the finest dining experience. Empire’s famous porterhouse for two is a standout. Equally impressive are the succulent seafood dishes, superb side dishes, and knockout desserts. The food is complemented by a wine list that is expansive, yet highly selective – and features many of California’s most sought-after vintages. Housed in the former premises of Michael Psilakis’ and Donatella Arpaia’s Anthos space, the room at Empire is also a highlight. A temple of glass and steel, where large windows and ample light abound. The overall feeling is bright, warm and inviting. Some walls are mirrored, other hung with framed pictures. Tables are set with crisp white tablecloths and deuces are not discriminated against, being given a four-top with ease. There are comfortable upholstered chairs, while a faux gas chandelier and assorted wine cases round out the comfortable atmosphere. There is a pleasant bar upon entering and an upstairs area for private parties and overage. Service is a strong point at Empire and you won’t find it better, more friendly, helpful and professional at any NY steak house. Enjoy one of the excellent cocktails or a selection from the terrific single malt list, with the perfect Jumbo Lump Crabmeat Cocktail. No shells, tender and moist, Absolute heaven. The warm rolls, bread and butter are good. 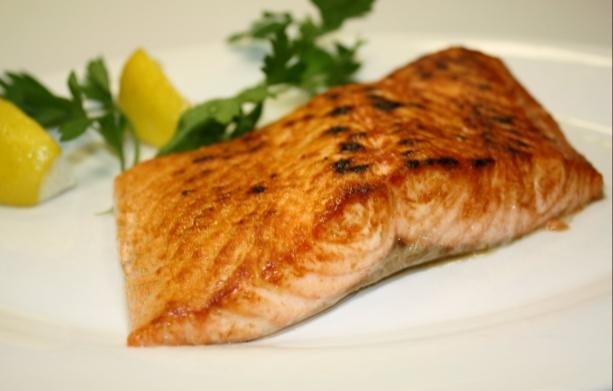 Go easy, Portions are generous and you must taste the amazing Sizzling Canadian Bacon ,extra thick by the slice, ($2.50) and the least expensive dish on the menu, before diving into fresh salads, or any of the excellent appetizers. For a treat to your eyes as well as your tummy, indulge in the Cold Seafood Platter (served family style featuring lobster, jumbo shrimp and crab meat cocktail). Follow this with any of the superb grilled meats. 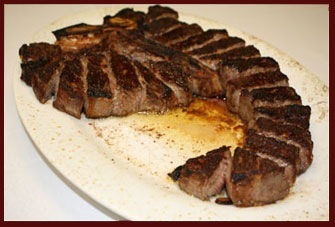 Numerous choices include the city’s premiere Porterhouse (aged 21-28 days) order it for 2, 3 or 4 people. The Prime New York Sirloin Steak is a winner. Ours arrived sliced and cooked exactly as ordered: charred, very rare, but not cold and juicy. There is also Filet Mignon, R ib Eye, Prime Rib and the most delicious (and enormous) Veal Chop imaginable. Let’s not neglect luscious Lamb Chops.
. Grilled Filet Of Salmon, Filet Of Sole Francese, Steamed Or Broiled Lobster Tail or a 4 Lb. 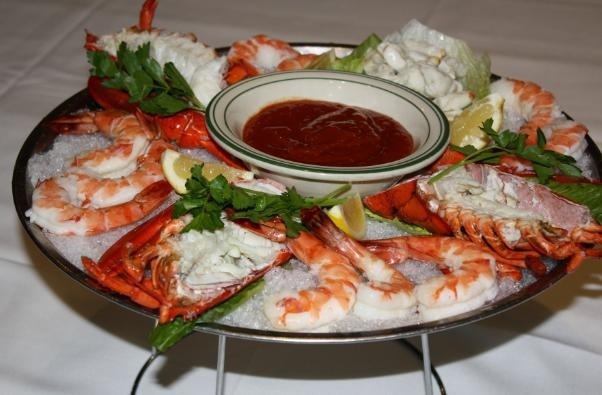 Jumbo Lobster (broiled or steamed) all fill the bill and are all perfect accompaniments to the delicious sides. We loved the heady German Potatoes and creamed spinach. Located at the heart of midtown (, on the edge of Rockefeller Center, Empire Steakhouse is accessible by bus, train, car and by foot. However you go, it is (as the French would say) worth the detour. Copyright 2010 By Punchin International. All Rights Reserved. We know you’re fresh off Thanksgiving, but Executive Chef Melissa Muller-Daka of Chelsea’s latest newcomer, Eolo, is gearing up to celebrate Chanukah with Sicilian style. 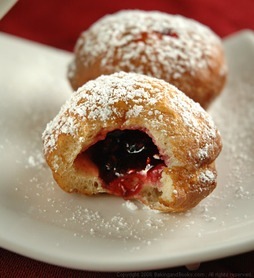 And frankly, we’re not ones to pass on Muller-Daka’s signature jelly-filled ricotta donuts. Not sure how Sicily and the Jews came together? Muller-Daka says the region has historically been tied to Jewish culture, having housed Jews for over 1500 years in scattered communities called “Giudecca.” Sicilian Jewish holiday eats focus on traditional flavors and fried delicacies like Fettucini with ricotta, raisins, pine nuts and cinnamon (a predecessor to kugel, perhaps) and Pollu Frittu (fried chicken with sweet potato and artichoke gratin)—proving that today’s sought-over comforts (jelly donuts, we’re looking at you) don’t need to be guilty pleasures. At least for one week, they’re totally righteous. Want to know more? Eolo’s Chanukah specials are listed below, and will be available for the full duration of the holiday. 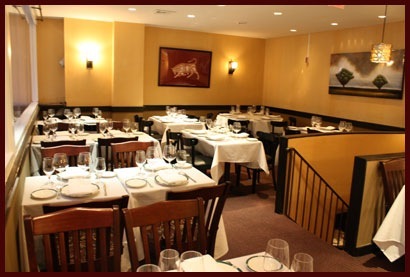 Reservations can be made by calling (646) 225-6606. Rod Strong was among the first modern wine pioneers with a vision to plant pinot noir in the Russian River Valley. In 1968 he planted the heritage River East Vineyard in the alluvial clay-loam soils adjacent to the winery in Healdsburg. 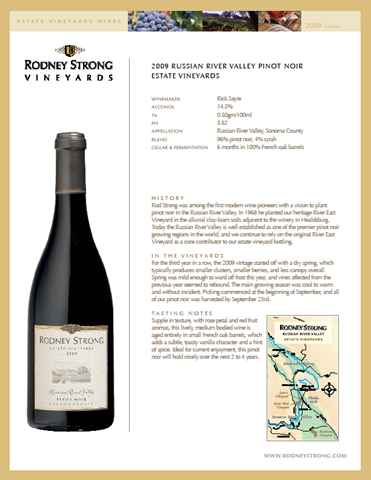 Today the Russian River Valley is well established as one of the premier pinot noir growing regions in the world, and they continue to rely on the original River East Vineyard as a core contributor to their estate vineyard bottling. For the third year in a row, the 2009 vintage started off with a dry spring, which typically produces smaller clusters, smaller berries, and less canopy overall. Spring was mild enough to ward off frost this year, and vines affected from the previous year seamed to rebound. The main growing season was cool to warm and without incident. Picking commenced at the beginning of September, and all the pinot noir was harvested by September 23rd. 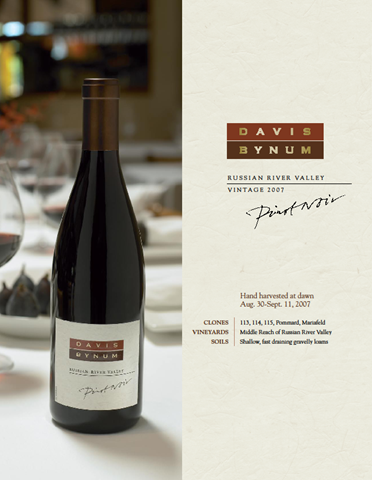 Davis Bynum is distinguished as the first winery to produce a single vineyard pinot noir from the Russian River Valley. The vintage was 1973 and the grapes were from Joe Rochioli’s now prized vineyard. Today, more than thirty years later, the heritage of Davis Bynum lives on through the hand crafted creation of pinot noir and chardonnay grown exclusively in Russian River Valley. SRP: $35. Very Burgundian, lush and delicious. Perfect with lamb, game or runny cheese. A discovery. Those looking for a musical holiday interlude can look toward West 52nd Street, where Gallagher’s Steak House will present “Holiday Jazz” featuring teenage musician Rhys Tivey and his band on Thursday night, December 23, a special Christmas Eve performance on Friday, December 24, and a Christmas Night encore on Saturday, December 25, with all engagements beginning 9:00 p.m. So, whether you’re an empty-nester seeking a quiet Christmas Eve, or not an observer of the religious holiday, Gallagher’s, located at 228 West 52nd Street, provides a nice musical alternative for New York City residents or Manhattan-bound visitors. 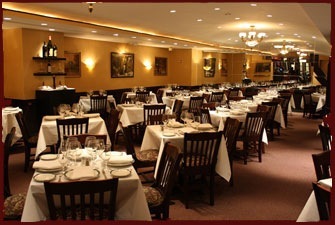 For reservations call 212-245-5336. Please mention JAZZ to be seated accordingly. Pre-performance reservations will be taken for 8 and 8:30 p.m., so that diners can place their orders prior to the start of the entertainment, while later seatings through 11:30 p.m. will also be accepted. There is a two-drink minimum required for those not dining. Complimentary cups of custom blended, organic teas from The Tea Set tea bar located at the store’s entrance. The Tea Set’s products will also be available for purchase and make perfect gifts. Complimentary glasses of champagne & a special champagne cocktail mixed with The Tea Set’s Red Peach Vanilla tea at the Pommery Champagne bar in the back of the store. Complimentary hand massages from Molton Brown staff along with personal shoppers who will be on hand to dispense gift ideas. Raffle tickets will be handed out at the door until 7:45pm. FEINSTEIN’S AT LOEWS REGENCY, the nightclub proclaimed “Best of New York” by New York Magazine, and “an invaluable New York institution” by The New York Post, continues its Fall 2010 season with the return of HOWARD McGILLIN – record breaking star of Broadway’s Phantom of the Opera – on Sunday, December 5 and Monday, December 6. His new show, which includes songs from the musical theater as well as romantic pop classics and swing standards, features Music Director Joseph Thalken on piano and John Beal on bass. Monday’s performance will feature special guest, Broadway soprano, Rebecca Luker. The shows take place at the Loews Regency Hotel (540 Park Avenue at 61st Street). Until recently, the popular French dessert macarons were not kosher. 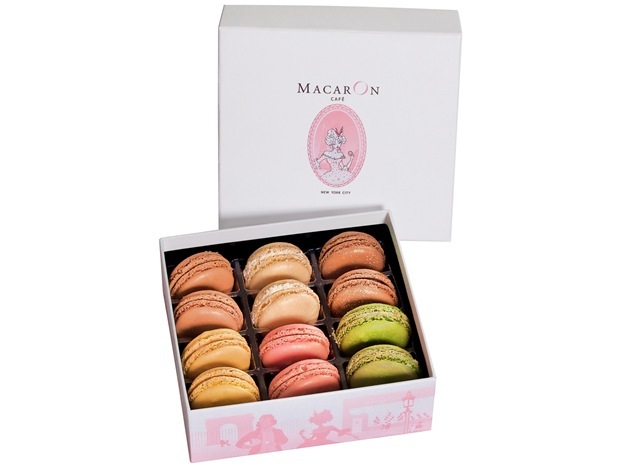 But one NYC based company that excels in these macarons is MacarOn Café, whose little almond delights bear the finest stamp of quality, flavor, sophistication and style. They have gone to great lengths to certify that their macarons are not only gluten-free, but also kosher certified and Rabbinically supervised—something they’re first in their class to do. The haute designers of the baking world, MacarOn’s signature French treats are created as collections befitting the season. For the holidays, it’s decadently sweet and cinnamony pumpkin that steals the show alongside other seasonal flavors: chestnut, matcha green tea, cranberry, and gingerbread, to name a few. From the base ingredients—of which 80% are sourced locally, and even more are organic—to the hand-piped fillings and customized decorative touches, every detail is considered and perfected, yielding what their customers are proud to call “the best macaron in the city.” Flavors change seasonally as well. 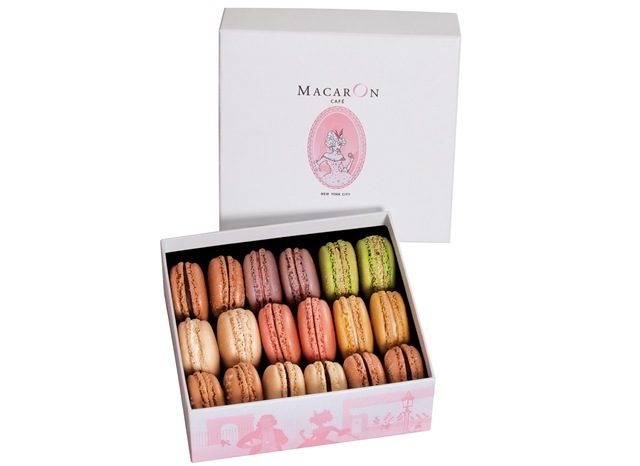 In addition, MacarOn Café is announcing brand new luxury gift boxes, which depict the company’s transatlantic journey. For those not residing in New York, these gift boxes can be ordered online for shipping across the country and would make a perfect addition to the Chanukah table. Call it a transcontinental love affair: with the opening of MacarOn Café on Madison Avenue, husband and wife duo Arnaud and Cecile Cannone are merging their generations-old love for French baking with New York’s creative, forward-thinking flair. The fifty-plus flavors of the café’s namesake cookie that rotate through their recently christened display case span far further than the classic pistachio and vanilla that classicist Parisians so often seek, and though they’re a New York-made product through and through, each continues to bear the hallmark of Cecile’s age-old family tradition and perfected French technique. The result? Impeccably baked and decorated bite-size treats bearing nothing but the finest stamp of sophistication and style. The secrets that separate MacarOn’s offerings from the pretenders, Cecile says, are entirely tactile, and it’s all about what the French call savoir faire. Indeed, most macaron recipes look quite similar—and similarly vague at points—nodding to the crucial emphasis on technique and manual knowledge that come with generations of macaron-making. Just as important to Cecile are the ingredients themselves: hers are sourced with extreme care and the savviest of palates, with pistachios that hail from Sicily, vanilla from Tahiti depending on season and harvest, floral essences served from small purveyors in the South of France, and hand-ground flour from California almonds, redolent with pure nutty flavor. It’s why her forthcoming cookbook, Macarons, Authentic French Cookie Recipes from the MacarOn Cafe, is confident in providing her expert tips and tricks to the trade, but guards Cecile’s sources for ingredients as the ultimate top secret. Having started her pastry pursuits at just seven years old as her family’s designated baker, Cecile showed an early predisposition to the trade that would ultimately—and sweetly—consume her life. Her husband happily employed her as the pastry chef at his signature gourmet store, Les Gastronomes, which they opened together in the 16th Arrondissement of Paris—the first of the many successes they’d experience as a dynamic culinary duo. The knowledge they cultivated there, and at their two subsequent restaurants, was nothing short of a mentally-stored encyclopedia of the world’s best ingredients—and it’s very much what continues to inform their philosophy on this side of the Atlantic. But when the Cannones made their move to New York in 2007 to open their first bakery on 36th Street, one thing was apparent: nobody had yet figured out what these pocket-sized Parisian staples were all about. Fast forward three years to the opening of MacarOn Café’s Madison Avenue flagship, and the tide has started to turn. With a more discerning palate for macarons than ever before, New Yorkers have found consistency, quality, beauty and elements of surprise in MacarOn’s goods. From the soft, merengue-like texture of their cookies to the eggshell crackle of their crusts and the silky, gooey fillings inside, they’re truly a smile-inducing picture of casual-chic French refinement.